Update, December 19: Ubisoft are getting into the Christmas spirit this week by giving away three big games for nothing but the price of installing Uplay. Ubisoft have orchestrated two free game giveaways this month, and with that most gift-givingest of holidays on the horizon they’re expanding that promotion through the rest of the week, and they’re adding a third free title to top it all off. Check out the best free games on PC. Pirate-themed open world murderator Assassin’s Creed IV: Black Flag, alt-history RTS World in Conflict, and hacking crime sandbox Watch Dogs are all free for the claiming as part of Ubisoft’s Playdays 2017 promotion. Just head to that page, sign into a Uplay account, and all three games can be yours. You have until December 23. This all seems to be part of Ubisoft’s big push for you to please, please use Uplay so they don’t have to give Valve a cut anymore. They’ve got a big sale going on featuring a nice 30% discount on the recently-released Assassin’s Creed Origins, and more than half off other games from this year including For Honor and Ghost Recon Wildlands. While you’re there be sure check out the Uplay-exclusive Ode, which happens to be one of the best games of 2017. 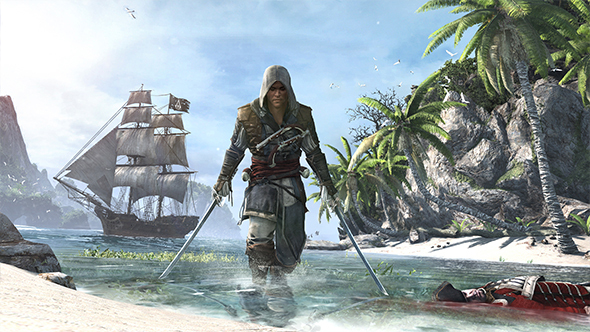 Update, December 11:Assassin’s Creed IV: Black Flag is now free to claim on Uplay. Ubisoft announced they’d be giving away two games this month, and the second of those promotions is now live for all to enjoy. Log into Uplay and hit the banner to claim a copy of Assassin’s Creed IV: Black Flag. You have until December 18. World in Conflict was already a solid get for the first part of the promotion, but there’s no denying the Assassin’s Creed name holds a bit more sway these days. Black Flag in particular is a fan-favorite in the series, as a light-hearted pirate tale that gets away from the convoluted backstory of the Assassins and Templars. Of course, this is all a transparent attempt to get you to install and sign in to Uplay on your PC, but if we’re getting free games out of the deal I don’t know how much room there is to complain. Original story, December 4:One of the best side bonuses of modern PC gaming is the fact that new games tend to just materialize in your digital distribution account of choice. I couldn’t tell you how I got this copy of Serious Sam 3 if my life depended on it, but I’m sure glad it’s there. Now Ubisoft are offering to expand your library even further as a little holiday gift, and all you have to do is log into Uplay. Okay, I realize you might be entirely keen on adding Ubisoft’s long-maligned digital distribution service to your regular rotation of game clients, but at least hear ‘em out. Starting now and lasting until December 11, you’ll be able to grab a free copy of the excellent alt-history RTS World in Conflict, along with its Soviet Assault expansion. Then, from December 12 through December 18, you’ll be able to pick up the pirate-themed Assassin’s Creed IV: Black Flag for free. You can even pretend you’re pirating it if that makes you feel like more of a high seas scallywag. To collect either game, you’ll need to log into Uplay and follow the prominent banner on the front page. Both titles will remain on your account for play long after the promotion has ended. And hey, while you’re there, why not check out the delightful, Uplay-exclusive platformer Ode?